Several cities in Central Asia have served and continue to serve as major centers of Central Asian culture and economy. Registan square after sunset in Samarkand, Uzbekistan. Central Asia is a large geographical region that runs from Russia to Afghanistan and from China to the Caspian Sea. It covers an area of over 1.5 million square miles and encompasses several countries. 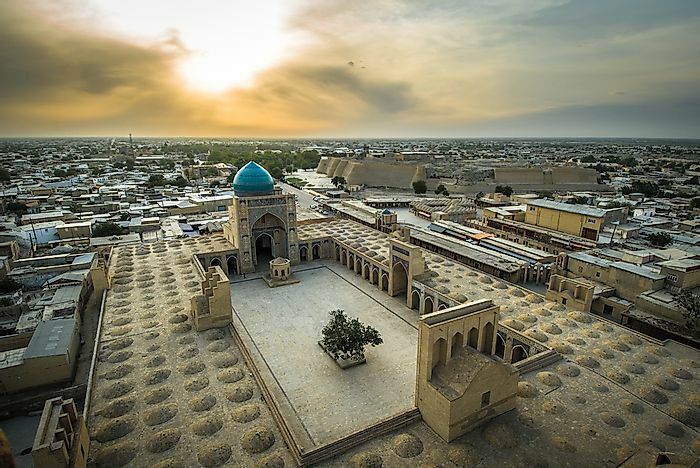 This region is rich in culture due in part to its history as a central location along the historic Silk Road that connected Europe with East Asia, West Asia, and South Asia. Today, Central Asia has a population of approximately 68 million, many of whom live in the region’s urban areas. This article takes a closer look at these major cities. The blue mosque of Mazar-e Sharif. 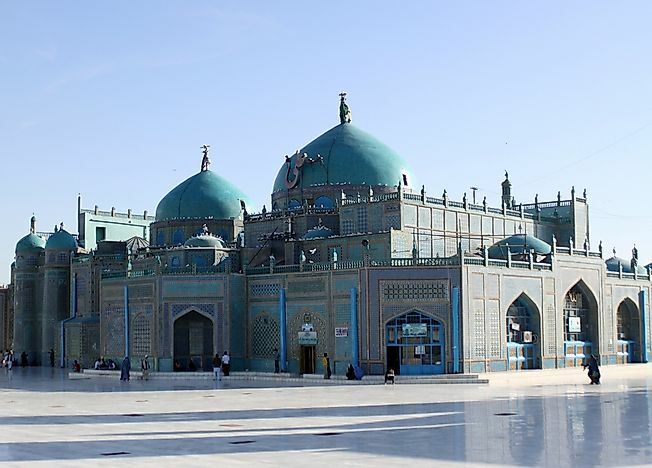 Mazar-e Sharif is located in the north central region of Afghanistan. 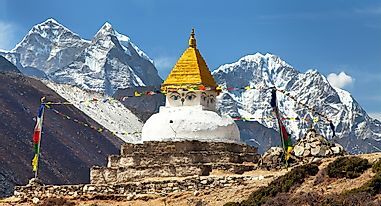 It is the country’s third largest city with a population of between 577,000 and 693,000. The demographics of this city are diverse and lend to its multiethnic status. The demographic makeup consists of Tajiks (60%), Hazaris (10%), Pashtun (10%), Turkmen (10%), and Uzbeks (10%). 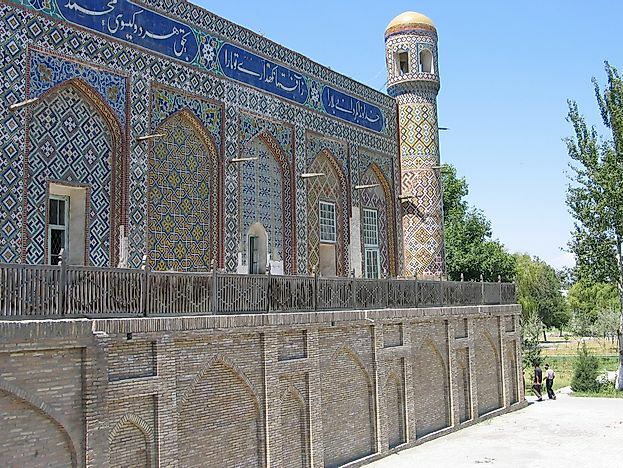 Mazar-e Sharif is home to Muslim and Hellenistic archaeological ruins, as well as famous mosques and shrines, which make this city a popular tourist destination. In addition to tourism, the economy here is based on trade, farming, and agriculture. Recently, the oil and gas industry has seen growth as well. 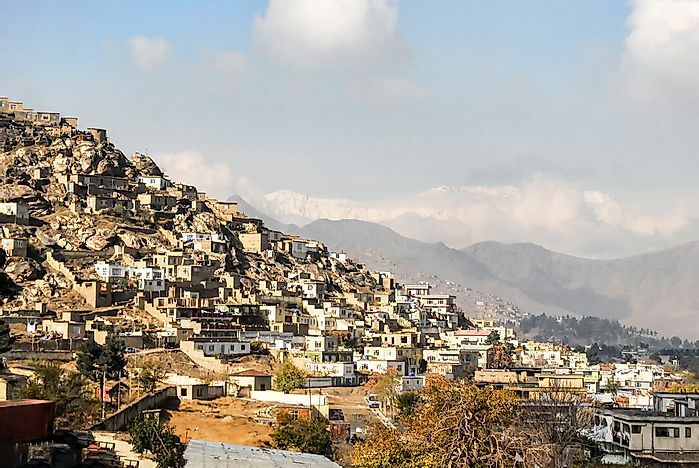 Informal settlements in Kabul, one of the fastest growing municipalities in the world. Kabul, the capital of Afghanistan, is another major cultural and economic center for Central Asia. This city has a population size of between 3.6 million and 4.5 million and is considered the 5th fastest growing in the world. Kabul has a history that dates back to over 3,500 years ago and has always played an important role in trade between Central and South Asia. 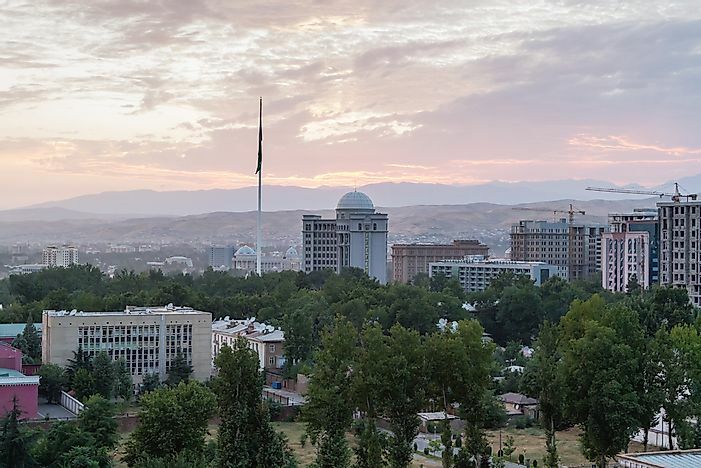 The economy of this city is based on the production of several products, including: dried fruit and nuts, Afghan rugs, furniture, fresh fruit, and leather. Amir Timur museum in Tashkent. Tashkent is the capital of Uzbekistan and is the country’s most populated city with 2,309,300 individuals living here. This area has been settled since pre-Islamic times and has a long and complex history which has influenced the rich cultural traditions found here today. This city is home to mosques, museums, and palaces. The Yunus Khan Mausoleum is here as well, where the grandfather of Babur, the Mughal Empire founder, is laid to rest. Tashkent is a multiethnic city with Uzbeks as the major ethnic group, making up 60% of the population. 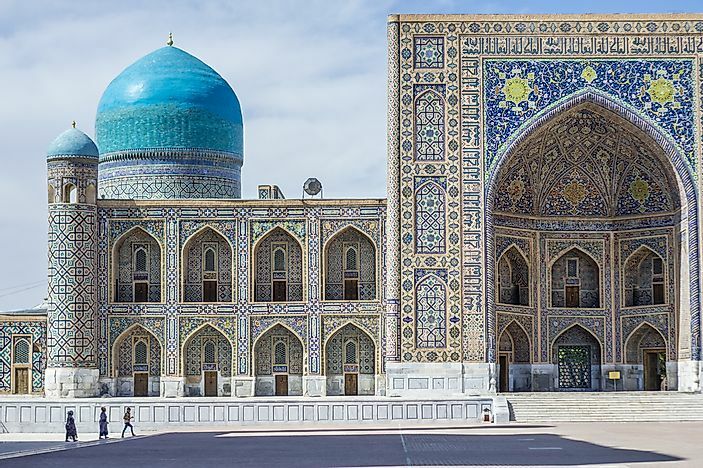 Samarkand is located in Uzbekistan and has a population of 504,423. Some historians believe this city was established sometime during the 7th or 8th centuries BC. 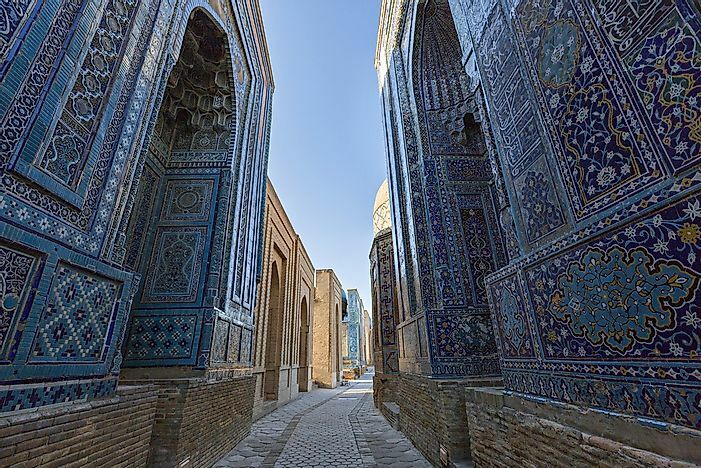 Because of its location along the Silk Road, Samarkand was once one of the most important cities of Central Asia. Today, it is home to several architectural sights, including: the Registan, an example of Islamic architecture; the Gur-e Amir mausoleum, the Bibi-Khanym mosque; and the Shah-i-Zinda necropolis. Additionally, this city is a center for Islamic study. Kokand is located in Uzbekistan along the Fergana Valley in the eastern part of the country. It is home to a population of approximately 187,226. 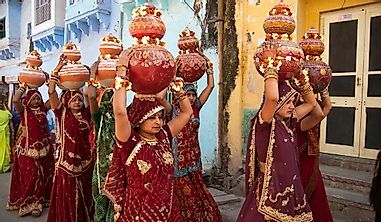 The history of this city dates back to the 10th century, when it was an important travel post between China and India. 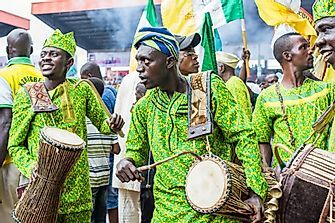 Today, the economy here relies on informal activities and the production of fertilizer, food, and machinery. Islam is the major religion practiced in this city, a fact that is reflected in the local architecture. Kokand is home to the Dakhma-i-Shokhin necropolis, the Jummi Mosque, the Palace of Khudayar Khan (once one of the largest of Central Asia), and the Khamza Museum. Bukhara is located in the most southern region of Uzbekistan and has a population of 328,400. It is considered a city-museum because it houses around 140 historical monuments. 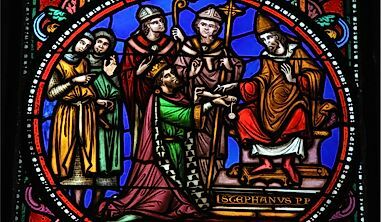 Its history dates back to over 5,000 years ago, during which time it was a center for academic study. Today, its historic center, where the majority of its mosques and madrassas are located, is listed as a UNESCO World Heritage Site. 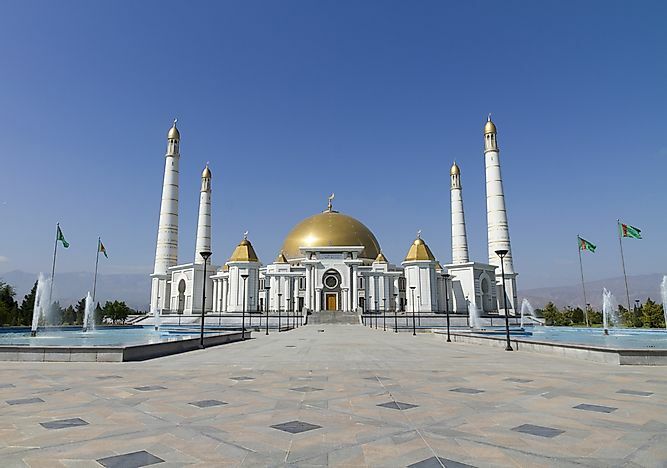 The grand mosque of Ashgabat. 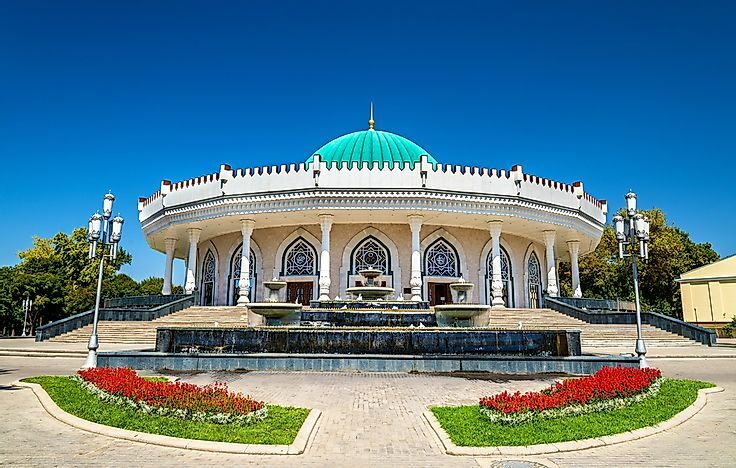 Ashgabat is the capital of Turkmenistan and is located between the Karakum Desert and the Kopet Dag mountains. With a population of over 1 million, it is the largest city in the country. This is one of the youngest cities on the list - established only in 1881 as a military fort. It is home to the first Baha’i Temple in the world, which was constructed in 1908. Today, the economy of Ashgabat is centered on metal production, cotton textiles, and government employment. Dushanbe is another important cultural and economic hub of Central Asia. It is also the capital of Tajikistan. This city, located where the Varzob and Kofar Nihon rivers meet, has a population of around 778,500 individuals. The demographics of this population are as follows: Tajiks (83.4%), Uzbeks (9.1%), ethnic Russians (5.1%), and others (2.4%). Dushanbe is home to the Dushanbe airport which is a hub for Somon Air. It also has a number of educational institutions, universities, museums, and palaces. 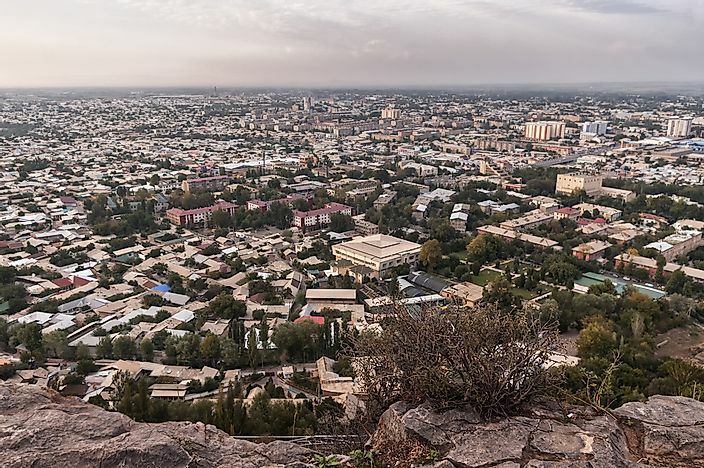 View of Osh from a nearby mountain. Osh is located in the Fergana Valley of southern Kyrgyzstan. It is the second largest city in the country and has a population of 255,400. This city is over 3,000 years old, making it the oldest in the country. 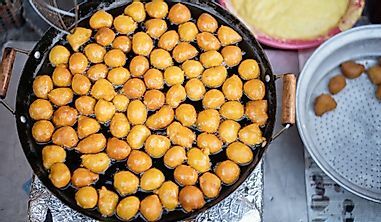 The largest outdoor market in Central Asia can be found here, located along the historic Silk Road. It grew in importance due to its silk production. During the Soviet era, Osh became an industrialized city with several government offices that continue to provide jobs today. 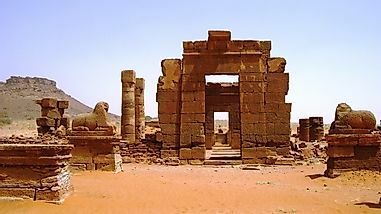 This city is home to the National Historical and Archaeological Museum Complex Sulayman, which was carved into the Sulayman mountain and is the country’s only UNESCO World Heritage Site. Bishkek is the capital of Kyrgyz and has a population size of 937,400. The architecture throughout the city reflects its long history, first as an important trading post along the Silk Road and later as a Soviet capital. Prior to its independence, Bishkek was an industrial center, however most of the plants were closed at the end of the Soviet era. Today, its economy relies on the financial industry; twenty-one banks have their headquarters here. 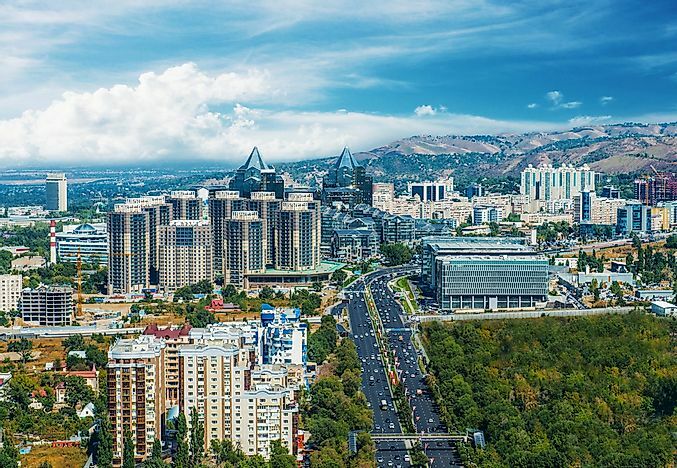 Almaty is the most important economic center in Central Asia. It is located in Kazakhstan and has a population of over 1.7 million, which is more than 9% of the country’s entire population. Its economy revolves around the banking and finance industries. During the Soviet-led era, this city was an administrative capital. Over the last 20 years, it has worked toward increased development, economic growth, and improved quality of life. 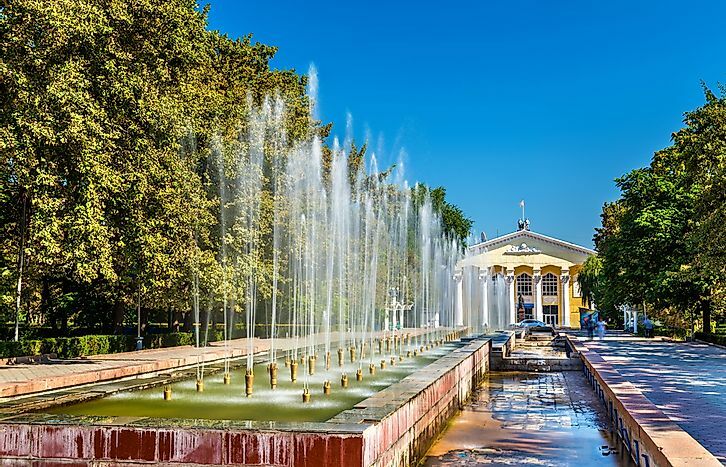 Some of the most famous sights here include: 125 fountains, the Shymbulak ski resort, the Big Almaty Lake, and the Medeo speedskating rink. 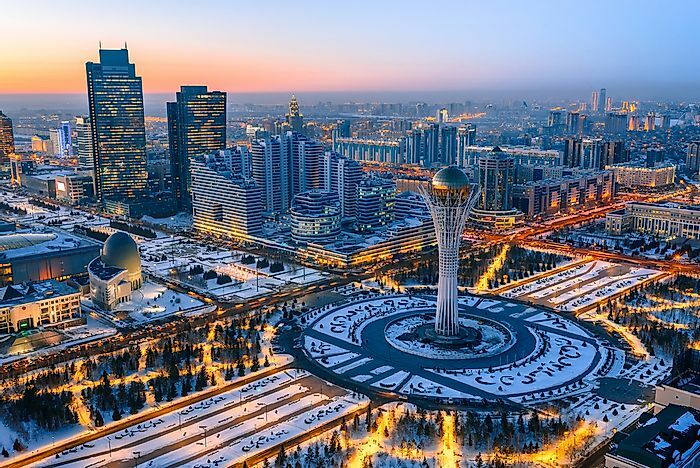 Astana is the capital of Kazakhstan and has a population of over 860,000. This city was founded in 1830 as a military fortification. It is relatively young compared to other cities in Central Asia. When it became the capital in 1997, its future design was planned by the Japanese architect Kisho Kurokawa. Today, it has many modern and futuristic looking skyscrapers, hotels, and buildings. Its economy is centered around public administration, communication technology, transportation, trade, and construction. How Many Countries are in Central America?